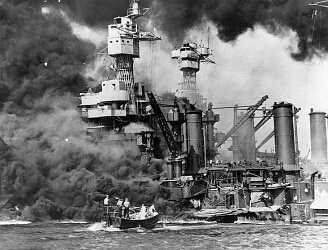 When Pearl Harbor in Oahu (Hawaii) was attacked by the Japanese Imperial Navy on the morning of 7 December 1941, approximately 100 ships of the U.S. Navy were present. Battleships, destroyers, cruisers, various support ships and one hospital ship, the USS Solace, were sitting at anchor. 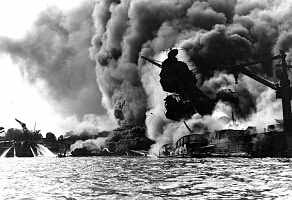 The attack was intended to weaken the U.S. Pacific fleet decisively as well as its defending Army Air Corps and Marine air forces. Within the next six months, the U.S. Navy was impaired in its role in the Pacific war, due to the devastating losses at Pearl Harbor. .. The sunken battleship USS Arizona (BB-39) burning furiously .. Forty-four members of the Navy Nurse Corps were stationed at the hospital and dispensary at Pearl Harbor during the attack. Thirteen of these nurses served aboard the Navy hospital ship USS Solace. The Navy Nurses faced the horror of war from its first day. Together with the rest of the Naval medical personnel, they treated the incoming casualties with self-sacrificing devotion and most efficiently, without rest for several days. Due to their successful care, many lives were saved. The 17 other Navy Nurses stationed in the Pacific area faced enemy attacks shortly afterwards. Twelve Navy Nurses were assigned to the U.S. Naval Hospital at Canacao, (Philippine Islands) and 5 Nurses to the U.S. Naval Hospital at Agana on Guam (Marianas Islands). The Japanese attacked these islands on 10 December 1941. While the 5 nurses in Guam were taken prisoners of war (POW), the nurses from Canacao were evacuated before the enemy invasion (but all, except one, were captured a few weeks later in Manila). When America entered World War II in December 1941, the Navy Nurse Corps awaited an important, difficult and sometimes dangerous task that needed highly skilled, dutiful and courageous nurses. Navy Nurses would be deployed at Naval hospitals inside the continental limits of the USA as well as overseas. Others would join the fleet in hospital ships.
. Over 800 Navy Nurses on active duty were serving in the Navy Nurse Corps at the time of the Pearl Harbor attack. The inactive Reserve Corps numbered over 900 nurses. After Pearl Harbor, many nurses followed the urgent call for more graduated nurses in the armed forces and enlisted either in the Army Nurse Corps or the Navy Nurse Corps. Within 1942, the Navy Nurse Corps had increased to over 2,900 nurses. Over 1,100 of them were serving in the Regular Nurse Corps. More than 1,700 belonged to the Naval Reserve Corps. 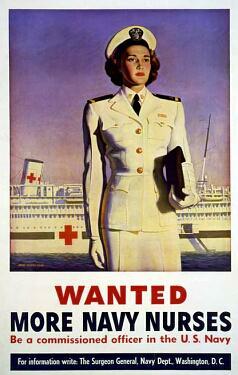 Nevertheless, in 1943, there still was a desperate need for nurses in the military. The successful work of the American Red Cross was important for the armed forces because it was acting as reserve agency for the Army and the Navy Nurse Corps. Captain Sue S. Dauser, Superintendent of the Navy Nurse Corps, was especially worried because in her opinion the Red Cross overemphasized the need of Army Nurses at the expense of the Navy recruitment. (But probably there were other reasons why many nurses preferred to serve in the Army Nurse Corps. For example, the Army Nurse Corps already had allowed the appointment of married nurses under the age of 40, in October 1942, while Navy Nurses had to be singles. If a Navy Nurse wanted to get married, she had to resign. To permit marriage was definitely a change in the Army regulations that made the Army Nurse Corps more attractive for many women.) .. 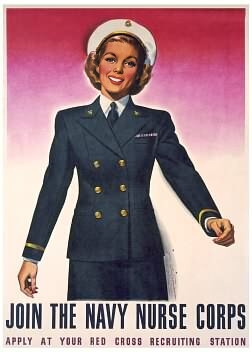 However, during 1943, the highest number of new recruits was appointed to the Navy Nurse Corps. With over 4,000 additional nurses the total strength topped the mark of 7000. 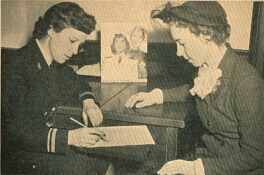 Young nurse applies for the Navy Nurse Corps. .. 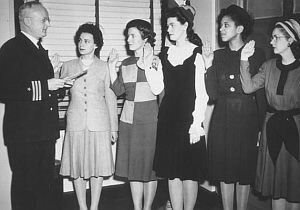 Hoping to improve the recruitment success, the Navy Nurse Corps took over the processing of applications in the end of 1943. Furthermore, the Red Cross always continued to inform all nurse applicants about both military branches and more than half of all new recruits were still referred by the Red Cross. The number of Navy Nurses continued to grow in the next year, but the rise was less than 1,900 members. At the end of 1944, the Nurse Corps numbered 8,893 personnel. Nearly 7,000 of them were Reserve Nurses on active duty. In early 1945, there was an urgent need of nurses again. The American military originally projected the number of required nurses based on overly optimistic forecasts that Germany and Japan would be defeated in 1945 without heavy casualties. However, the Germans launched their strong Ardennes counteroffensive of December 1944 in Europe and unexpectedly fierce Japanese resistance reached new heights in the Pacific. Delano Roosevelt ... In January 1945, President Roosevelt sent a message to the Congress concerning this problem. He requested the draft of nurses into the armed forces because the volunteering had not been sufficient enough. The draft bill was put down after a few weeks of discussion. Instead, other efforts were made to raise the number of volunteers. Another factor was that the War Department opened the service in the armed forces for Black nurses, ending all former quotas and exclusion. There were about 9,000 graduated Black nurses in the United States at that time. 308 of these Black nurses already served in the Army Nurse Corps that had permitted Black nurses to join the Army Nurse Corps in in 1941 (but in limited numbers only). The Navy Nurse Corps had not accepted any Black nurses so far. The first Black nurse in the Navy Nurse Corps started her active duty in April 1945. Until January 1948, none of the Black nurses was a member of the Regular Corps. All of them had been members of the Reserve Nurse Corps . The Navy Nurse Corps put much more efforts to trying to stop the high losses of members due to marriage. In 1944 an average of more than 100 nurses a month resigned by reason of marriage (the high point being 160 resignations in November 1944). In January 1945, a change in the regulation permitted Navy Nurses in service to marry without being required to resign. In February, former members of the Navy Nurse Corps and Naval Reserve Nurse Corps were permitted temporary reappointment, if they had resigned because of marriage between January 1944 and January 1945. Only women who were already married before they wanted to join, were still barred from entering the service. After the end of war, no large Nurse Corps was needed anymore. Therefore, in September 1945, the relaxed regulations considering marriage were rescinded. Additionally, a month later an official announcement declared that effective 1 November 1945 all married officers of the regular and the reserve corps who were temporarily reappointed would be released. This way the Nurse Corps conveniently disposed a part of the excess nurses without granting them the usual 6 months provision after the end of war. A Navy Nurse applicant is taking oath of office. .. The Navy Nurse Corps reached its peak strength in June 1945 with over 11,000 members on active duty. Only 1,800 of them served in the Regular Corps. The big majority of more than 9,000 nurses belonged to the Reserve Nurse Corps. In April 1945, the Navy discontinued active recruiting of nurses. Surplus applicants were referred to the Army Nurse Corps. The decision to stop recruitment of nurses could have caught the Navy severely shorthanded with nurse personnel in the following months. In fact, the Navy casualties soared in 1945 with the sanguinary fleet losses off Okinawa. A catastrophe in the low number of nurses was only avoided by the quick surrender of Japan following the atomic bombings. The nuclear destruction of Japanese cities (an Air Force mission unforeseen by the Navy) and the unexpected surrender in September spared the Navy a major embarrassment for lack of proper planning ahead. A total of 40 Navy Nurses died in service, but no death was a result of enemy action. After the war, a huge demobilization started. Within a year, the membership had been reduced to about 2,300 nurses (nearly 1,250 of them serving in the Regular Navy). The government offered help to bring back all the veterans, including the women who served in the armed forces, to Civilian Service. For example, a money allowances was granted through the G.I. Bill of Rights for unemployed or partially employed veterans. However, the situation for nurses to find a job after leaving the service was much better than for many other professions. The enormous numbers of disabled and wounded soldiers requiring long-term (some required years or decades of intensive medical treatment) and short-term care, following the war, required more nurses than were available and made jobs for any returning from the service. and Marine Corps Military Personnel Statistics, 30 June 1959. When America entered World War II, the Navy Nurses had been granted neither the status of Naval officers nor the rating of enlisted personnel. Only Army Nurses had received the relative rank of officers in 1920. Eventually, the Congress reconciled this inequality and authorized permanent relative rank for Navy Nurses as well, on 3 July 1942. 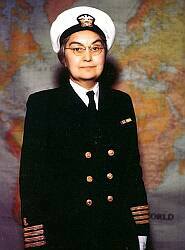 The Navy Nurse Corps received relative rank from ensign to lieutenant commander. Captain Sue S. Dauser (NC) USN, photographed at the Navy Department, circa 1944. Ms. Dauser was the first women to wear the captain’s four golden stripes on her sleeves. .. On 22 December 1942, Congress passed a law authorizing temporary relative rank from Captain to Ensign and a higher temporary pay scale for Nurse Corps personnel for the war period plus 6 months. These were further concessions to the vital job nurses did during this war. Of course, the improvements were intended to attract more nurses to apply. Two assistant superintendents in the rank of commander, and 4 directors in the rank of lieutenant commanders were appointed to the Navy Nurse Corps. On 26 February 1944 the Army and Navy Nurses were given actual military rank, approved for the duration of the war plus 6 months. 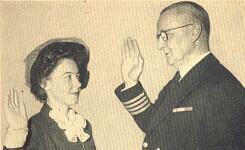 Sue S. Dauser was appointed the first female captain in the U.S. Navy. Finally in April 1947, the Navy Nurse Corps received permanent commissioned status and the corps was integrated in the medical Department.